All cancellations must be made by the person who made the original reservation and be in writing. 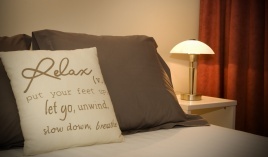 Cancellations may be emailed to info@ballinamotel.co.nz . The Ballina Motel will acknowledge receipt of the email and the cancellation request. You may not store, transmit, reproduce, publish, upload, or distribute in any form any material from this website without the Ballina Motel's prior written permission, except that you may download one copy on a single computer for your personal non-business use. If you modify or use the materials for any purpose you will be in breach of the Ballina Motel's Intellectual Property Rights, which are protected by New Zealand and international law. If you download software from this website (which includes files, images, data and code) the Ballina Motel retains complete ownership of that software. You must not redistribute, decompile, disassemble, reverse-engineer or deal with the software in anyway. The Ballina Motel may provide links from this website to other websites for your convenience and assistance. You acknowledge and agree that the Ballina Motel is not responsible for any content, advertising products, services or other materials on, or available, from these websites or resources. Any dealing you have with a third party provider is solely between you and that third party. Your dealings are with the third party provider directly and not with the Ballina Motel as agent for the third party provider. The Ballina Motel has taken reasonable care to ensure that third party providers are reputable, but the Ballina Motel is not liable for any direct or indirect loss or damage you or anybody else might suffer by dealing with a third party provider. The Ballina Motel does not undertake that the site will be available, uninterrupted or error free. 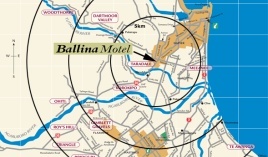 The Ballina Motel will not be in any breach of this agreement or in any way liable, if it is prevented from complying with the supply of accommodation and related services by reason of Act of God, Act of Public Enemy, War, Earthquake, Riot, Fire, Storm, Flood, Explosion, Compliance with any law of Government Restraint Order, Rule, Regulations, Strikes, Lock Outs or any other cause not reasonably within the control of the Ballina Motel. The Ballina Motel shall not be held liable for any loss of any kind whatsoever by motel guests, arising from any breach of these terms and conditions by the Ballina Motel or from any negligence, misrepresentation or other act or omission on the part of the Ballina Motel. The Ballina Motel has no liability under any circumstances, including but not limited to negligence, for any special or consequential damages arising out of use of, or inability to use, this or any connected site even if advised of the possibility of damage. The Ballina Motel's maximum liability to you for any damages, losses, costs and expenses under any cause of action is limited to the value of the Ballina Motel's charge for any service or product booked by you via this website. The Ballina Motel and the person/guest making the reservation acknowledge and agree that the Consumer Guarantees Act 1993 has no application to this agreement between them. The waiver by the Ballina Motel of any breach of any one or more terms contained in these terms and conditions will not be construed to be a waiver of any succeeding breach of such terms or of any other terms. You are responsible (financially and otherwise) for your use of this website. Information you supply, whether to the Ballina Motel or to a third party provider, is accurate and will not be deceptive or likely to deceive. The person making the reservation will indemnify the Ballina Motel and its officers, employees and agents against all costs, claims, losses, liabilities, damages and expenses incurred as a result of any act, omission or breach of these terms by the person making the reservation, their officer, employee or agent or the guests booked. These Terms and Conditions are governed by the laws of New Zealand and you agree to submit to the exclusive jurisdiction of the New Zealand High Court. Any term which is void or unenforceable shall be treated as severed from these Terms and Conditions, and shall not affect the enforceability of other terms and conditions. These Terms and Conditions constitute the whole agreement between you and the Ballina Motel and shall not be modified except by agreement in writing signed by the Ballina Motel. If you are accessing the website from outside New Zealand, you must comply with all the laws of the country in which you are accessing the website from and with all New Zealand laws. The Ballina Motel may change this website or any of these terms and conditions at any time. The above terms and conditions as set out supercede all previous agreements, arrangements and contracts.